One of the most used controllers is the Proportional Controller (P-Controller) who produce an output action that is proportional to the deviation between the set point and the measured process value. The proportional band P, express the value necessary for 100% controller output. If P = 0, the gain or action factor kP would be infinity - the control action would be ON/OFF. Note! A proportional controller will have the effect of reducing the rise time and will reduce, but never eliminate, the steady-state error. With integral action, the controller output is proportional to the amount of time the error is present. Integral action eliminates offset. The integral controller produce an output proportional to the summarized deviation between the set point and measured value and integrating gain or action factor. Integral controllers tend to respond slowly at first, but over a long period of time they tend to eliminate errors. The integral controller eliminates the steady-state error, but may make the transient response worse. The controller may be unstable. The integral regulator may also cause problems during shutdowns and start up as a result of the integral saturation or wind up effect. An integrating regulator with over time deviation (typical during plant shut downs) will summarize the output to +/- 100%. During start up the output is set to 100%m which may be catastrophic. With derivative action, the controller output is proportional to the rate of change of the measurement or error. The controller output is calculated by the rate of change of the deviation or error with time. The derivative or differential controller is never used alone. With sudden changes in the system the derivative controller will compensate the output fast. The long term effects the controller allow huge steady state errors. A derivative controller will in general have the effect of increasing the stability of the system, reducing the overshoot, and improving the transient response. The functions of the individual proportional, integral and derivative controllers complements each other. If they are combined its possible to make a system that responds quickly to changes (derivative), tracks required positions (proportional), and reduces steady state errors (integral). Note that these correlations may not be exactly accurate, because P, I and D are dependent of each other. Changing one of these variables can change the effect of the other two. Engineering ToolBox, (2003). 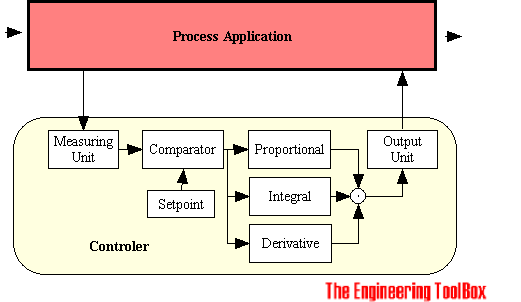 Process Controllers. [online] Available at: https://www.engineeringtoolbox.com/process-controllers-d_499.html [Accessed Day Mo. Year].